“We have a very serious concern that we haven’t seen the demand-management document. We haven’t seen what it is our Upper Colorado River commissioner is potentially going to sign within the next month. We haven’t seen those documents that are about to be executed. We’ve been told that we don’t need to see them. We’re not OK with that. We don’t think it’s acceptable. We think those documents need to be shared with us and frankly the impact of those documents needs to be shared with the water users of the Western Slope and the state of Colorado,” Mueller said. The outcome of the “Upper Colorado River Basin Drought Contingency Plan” could be the biggest water related decision in Colorado history. As Lake Powell’s water level continues to plummet, the Upper Colorado River Commission has proposed to enact “Demand Management” that could trigger hundreds of thousands of acres of farms being dried up in Colorado to send their water downstream to try and save Lake Powell. At the Colorado River District annual meeting on Friday, Sept. 14th, Mueller is reported to have said, “It would take as many as 10 years to get 1-2 MAF in Powell.” (see tweet link) However, Lake Powell is now down over 10 million acre feet of water, and the combined total of water in Lake Powell and Lake Mead are at their lowest point in history (see John Fleck’s graph in tweet), now down 21 million acre feet. Save The Colorado has estimated (see blog link) that thousands of Colorado farmers would have to be paid a few billion dollars to buy a minimum of a million acre feet of water which would dry up hundreds of thousands of acres of farms in order for “Demand Managment” to have any slight consequential effect on the water level in Lake Powell. 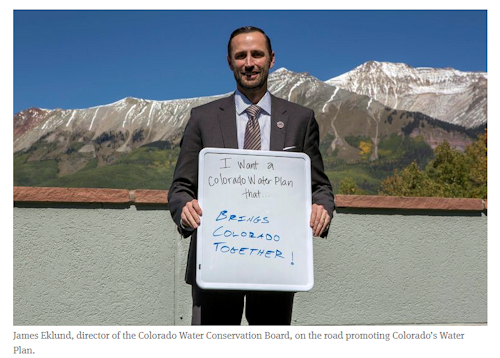 The draft of the plan has been discussed for over two years, In fact, a year ago in 2017, Save The Colorado sent a Freedom of Information Act request (see link) to the Upper Colorado River Commission to get a draft of the Drought Contingency Plan. The Commission responded by sending slide presentations, but said no draft document existed at that time. The comments in the Sept 14, 2018, Grand Junction Sentinel indicate that a draft document now exists. Will Denver and the Front Range Drain the Colorado River and the West Slope?